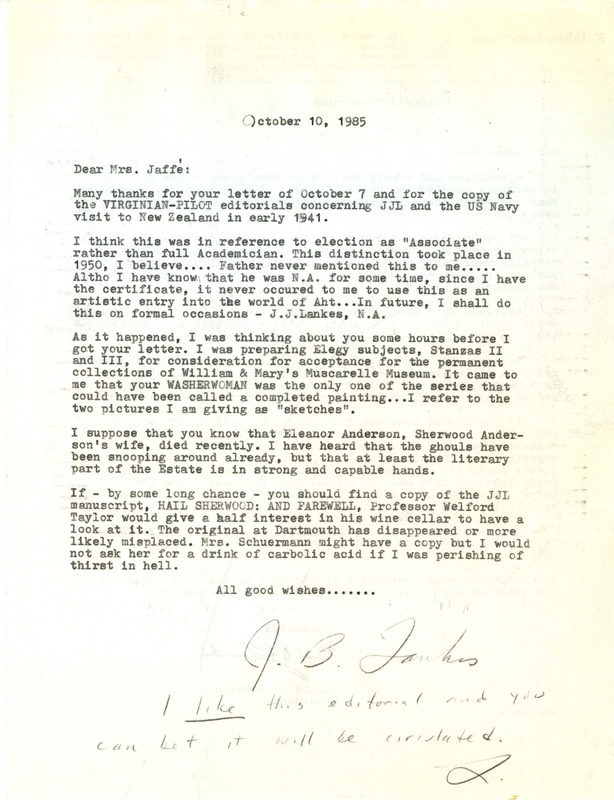 Letter from Lankes to Jaffe about copies of Virginian-Pilot editorials, further disposition of J. J. Lankes works, and the recent death of Eleanor Anderson. Permission to publish material from Jaffe-Lankes Family Correspondence must be obtained from Special Collections, Virginia Tech. Researchers wishing to cite this collection should include the following information: Jaffe-Lankes Family Correspondence, Ms2019-014, Special Collections, Virginia Tech, Blacksburg, Va.
Lankes, J. B. (Julius B. ), 1915-2010, “Letter, J. B. Lankes to Alice Jaffe,October 10, 1985 (Ms2019-014),” VT Special Collections Online, accessed April 23, 2019, http://digitalsc.lib.vt.edu/Ms2019_014_JaffeLankes_/Ms2019_014_JaffeLankes_B1F5_LankestoJaffe_1985_1010.